All CinemaNext engineers & technicians undergo extensive training on new technologies on a regular basis and bring with them a strong technical and analytical background as well as excellent communication and customer service skills. Each one avails of training certificates and approvals from our preferred partners. Our top priority is to ensure your screen never goes black. With over 9,000 screens installed since 2004, we provide fast and flexible on-site maintenance of your equipment since on-time support is critical. We offer various levels of service agreements to best meet your needs and budget. 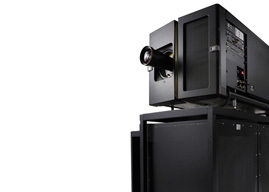 All packages are designed to offer continued support and on-site maintenance at any cinema location. We have designed online tools to help clients follow the progress of their updates and service requests. To ensure high-level remote connectivity, we use Cisco/Soekris, which allows us secure access and the ability to interact with cinema networks as well as enable proactive monitoring of devices. We also provide training to complement the information sessions given by manufacturers. It is essential that all cinema staff members be confident when maneuvering their projection system, sound equipment or content solutions. This training can take place at the client's site, head office or regional office. What happens if an issue arises in a client’s cinema? Whether through the ticketing system or a phone conversation with one of our skilled engineers or technicians, we will diagnose and fix most technical glitches from afar since most cinema software and hardware today can be controlled remotely. This enables the NOC to obtain detailed information on the client’s issue and to resolve it rapidly. Of course in some cases, a local technician and/or a replacement part might be required. Consumables and spare parts are available both on central and local levels through our powerful supply chain.